Global air traffic grew 6.5 percent in 2018, according to the International Air Transport Association. That growth outpaced the year's 6.1 percent capacity growth, leading to a record load factor of 81.9 percent. "2018 was another year of strong passenger demand," said IATA director general and CEO Alexandre de Juniac. Compared to 2017's 8 percent growth in demand, however, 2018 was slower. IATA attributed the relative slowdown to the second half of the year. IATA forecasts global passenger demand to rise 6 percent in 2019, thanks to a relatively solid global economy. "We expect similar, if somewhat moderating performance in 2019," said de Juniac. "Nevertheless, slowing traffic growth in the second half of 2018, coupled with concerns over issues including Brexit and U.S.-China trade tensions, are creating some uncertainty to this positive outlook." 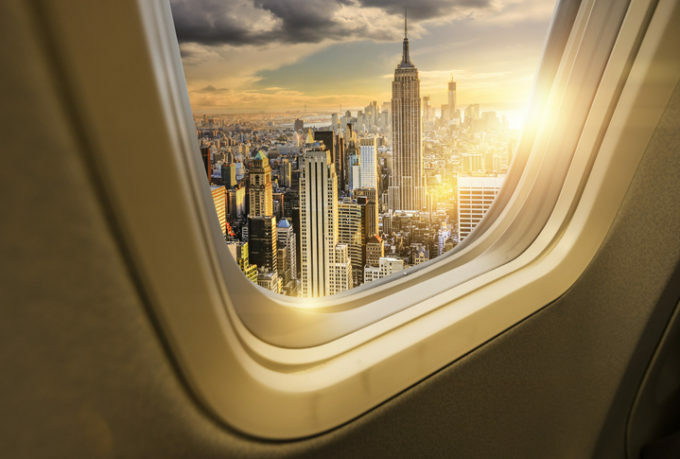 The total consolidated dollar value of airline ticket sales sold by U.S.-based travel agencies in 2018 totaled $95 billion, up 7.1 percent, according to Airlines Reporting Corp. The average price for a U.S. round-trip ticket was $490 in 2018, up $6 from 2017. 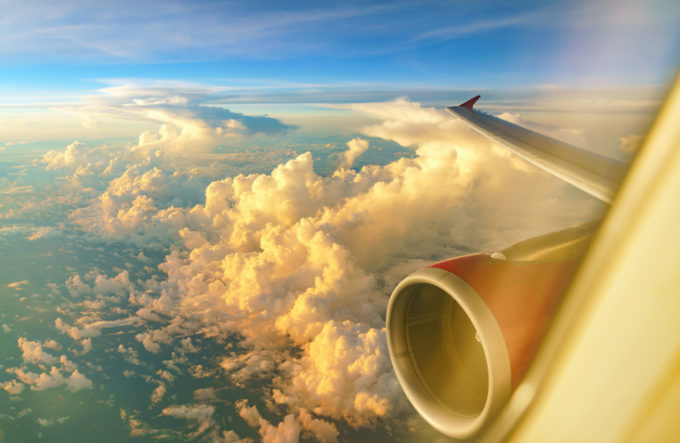 ARC president and CEO Mike Premo attributed the rise in sales in 2018 to "more capacity in the airline industry, more international (higher-priced) tickets, fuel-related fare increases and surcharges from higher fuel costs, more taxes and passenger facility charges." Passenger trips rose 2.7 percent to 296 million in 2018. U.S. domestic trips totaled 187 million, up 0.24 percent, while international passenger trips jumped 7.3 percent to 109 million. As a benchmark of corporate travel trends, ARC reports the number of trips handled by agencies that self-report as handling at least 70 percent corporate/government business. 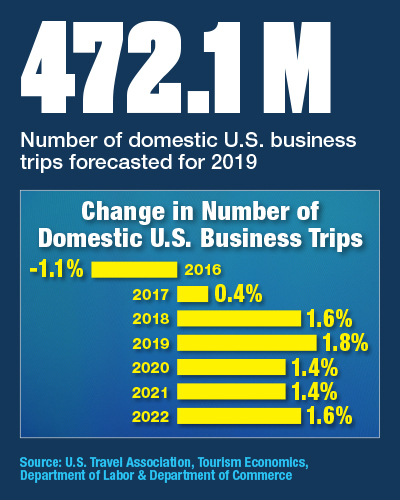 Those trips rose 3.79 percent in 2018. Delta has a total order with Airbus for 40 A220-100s and 50 of the larger A220-300s to come into its fleet through the end of 2023, part of Delta's plans to replace 20 percent of its older aircraft over the next few years. By the end of 2019, pending government certification, United plans to add 50 50-seat Bombardier CRJ 550 aircraft to its fleet, each with 10 United First seats, 20 Economy Plus seats and 20 Economy seats. Those aircraft will replace single-cabin 50-seaters and are slotted to first appear on flights operated by United regional partner GoJet in the second half of this year, first in Chicago O'Hare and then in Newark. The aircraft also feature storage closets for carry-on luggage so passengers won't have to gate-check their bags. Drawn from more than 50 million reported expenses comprising $3.3 billion in total spending across Certify's North American corporate clients, the report found that Uber rides comprised 11 percent of all expensed transactions last year, followed by Starbucks, at 4.1 percent. Uber competitor Lyft made its debut in the yearly top 10, ranking sixth with 2.8 percent of all expensed transactions. For the fourth quarter alone, Uber accounted for 11.9 percent of all transactions, making it also Q4's most-expensed brand. And after entering the quarterly top 10 at No. 6 in the third quarter, Lyft moved up one spot to fifth for the fourth quarter with a 3.4 percent share of all transactions expensed.